Why did I share this recipe? Candied Kumquats aren’t something the average person bothers with…. Well… I’m in the produce section of the grocery store the other day, and there were these boxes of little orange, olive shaped things. KUMQUATS! I’ve never seen them in a little plastic box at the grocery store before. In my experience, Kumquats live on trees, and stay there (at least until a couple of kids come along and start a Kumquat war… then the tree becomes the Ammo Station). You see, (and yes, I know some of you already know this… this is for the benefit of that new guy in the back) I grew up in Southern California surrounded by Citrus. My dad was a wholesale nurseryman, so our world was filled with Oranges, Lemons, Limes, Tangerines, and even Kumquats….. but…. 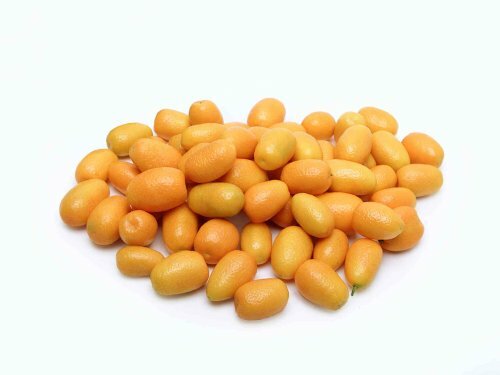 what good was a Kumquat? Ever seen them? They look like mini oblong orange things. Sort of the Christmas Decoration of the Citrus World. The Nursery grew them, because the plants were popular during the Chinese New Year, since they were considered “Lucky”…. I wasn’t sure what to think of a fruit that was pretty much all peel. (I’m the kind of person who strips every last smidgen of the peel and pith off of my oranges). But there they were in the store… Kumquats.. and, I decided to take on the challenge. I bought a couple boxes, and spent the day in the kitchen… the result? A whole lot of flavor, and a few new recipes. Turns out, making Candied Kumquats is super easy, and they are amazingly delicious. Tart, sweet, and such a pretty orange color. I’ll start with this basic recipe… then I’ll follow up with more treats that you can create using this basic Candied Kumquat recipe. What Can I Make with Candied Kumquats? Prepare your Kumquats... give them a wash.
Slice the Kumquats to about 1/4 inch slices... I used a serrated knife because I felt it gave me more control. Discard the stem end. Pick out the seeds... discard... Now, don't panic if some seed bits go through, it's ok, they won't sprout in your tummy, promise. In a saucepan over medium heat, bring the water and sugar to a boil. Stir occasionally to make sure that the sugar has completely dissolved. Let boil 5 minutes over medium. Reduce the heat to simmer, add the Kumquats... stir them in.... and let them simmer for 10 minutes. Stir occasionally. After 10 minutes, remove the kumquats from the syrup using a slotted spoon ... just put them in a bowl for a few minutes. Let the syrup continue to simmer for a few minutes, maybe 3 or 4? until it thickens up a bit. Add the Kumquats back in the syrup, give them a stir, let them cook 2 more minutes. 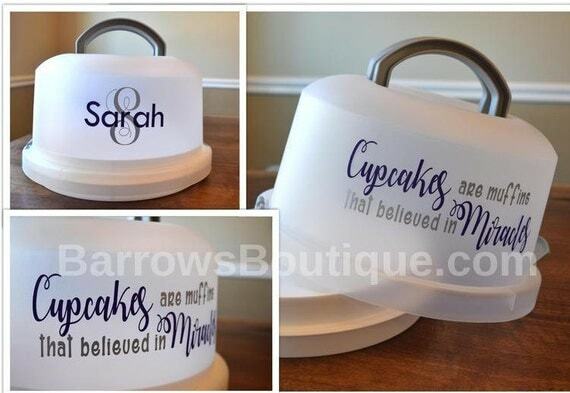 Now you can use them. According to my interpretation of the Department of Agriculture site, Kumquats which are native to China, are a slow growing, thorny, evergreen shrub that bears olive shaped orange citrus fruits. Supposedly, you can eat them raw… but… well… I’ve never tried them that way. They are preserved as marmalade, or candied for dessert and other cooking. They are a pretty plant, since they are green year round. The fruit is ripe in January/ February, so, it brightens up winter. 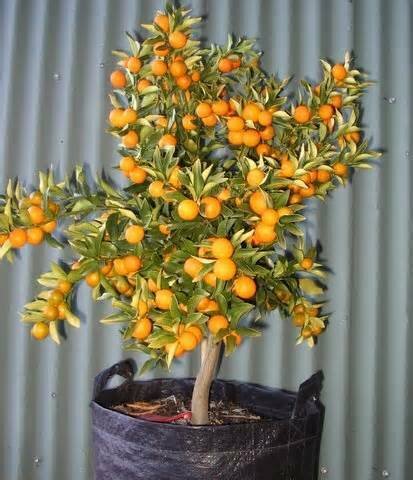 Kumquats are small enough to be grown indoors. 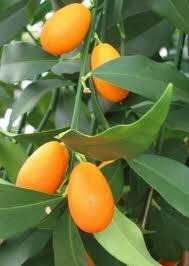 Hee Hee… if you keep your Kumquat Plant near the sofa, you can have a fresh healthy snack without even getting up. Wonderful recipe for candied kumquats!